The Home tab includes the command buttons normally used for creating, formatting, and editing a worksheet. The commands are arranged into the Clipboard, Font, Alignment, Number, Styles, Cells, and Editing groups. You’ll find command buttons for adding particular elements to a worksheet (like graphics, PivotTables, charts, hyperlinks, and headers and footers) on the Insert tab. These commands are easy to locate in the Tables, Illustrations, Charts, Links, and Text groups. When you’re ready to prepare a worksheet for printing, check out the commands on the Page Layout tab, arranged into the Themes, Page Setup, Scale to Fit, Sheet Options, and Arrange groups. The Formulas tab includes the command buttons normally used when adding formulas and functions to a worksheet or checking a worksheet for formula errors. 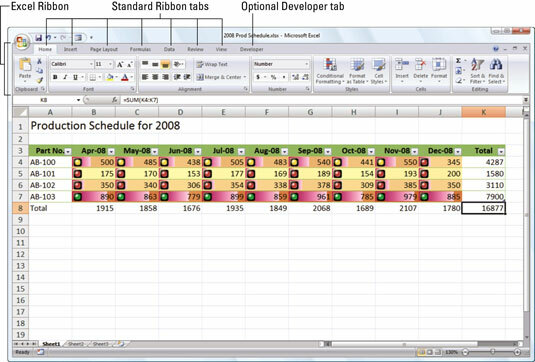 This tab includes four groups: Function Library, Defined Names, Formula Auditing, and Calculation. When you want to work with data tools related to importing, querying, outlining, and subtotaling, check out the Data tab. You’ll find the commands arranged into the Get External Data, Connections, Sort & Filter, Data Tools, and Outline groups. The Review tab includes the command buttons normally used when proofing, protecting, and marking up a worksheet for review by others. This tab includes the Proofing, Comments, and Changes groups. When you want to change the appearance of the Worksheet area and the data it contains, look for these commands on the View tab. You’ll find the Workbook Views, Show/Hide, Zoom, Window, and Macros groups on this tab.